These are lightly salted, Super Extra Large peanuts with a light coat of sugary honey. Once you try this fantastic peanut taste you'll be hiding your jar from family and friends. PBS show about Bertie County Peanuts tempted me to order. Got both the Blister Fried and Honey Roasted Peanuts. The Honey Roasted were gone in a day! Great flavor and texture. Will order more soon. Owner Response:Thanks for the kind words! Saw your Peanut Company on WBTV's Carolina Camera and thought I would order some and I truly enjoyed them thanks. These honey roasted peanuts are delicious. Highly recommended. We're on our second 30 oz tub of HRP's, and of course we think they are delightful. Everyone loved them at our Christmas family gathering! Thanks for a great product! Trying this spicy combo of flavors on your blister fried peanuts was a great idea! Just enough heat and just enough smoky flavor to make them irresistible! Another hit from Bertie! This is the second time I have ordered these and I love them! I think they are better than the Planters brand so I ordered another 30oz tub of the Honey Roasted Peanuts and a few other things as well. Great tasting and large peanut. We purchase your peanuts for our high school office in our small Christian School. Everyone LOVES them and talks about how much better they are than the ones we "used to get" at our local club store! They don't even compare!!! Thanks for such a great "peanut." I've been buying them now for 2 years, and can't stop now! Carefully hiding my jar of the honey peanuts here. Some things are way too good to share with anyone! Definitely one of the best treats ever! These are great! Better buy two, because one will be gone in no time. 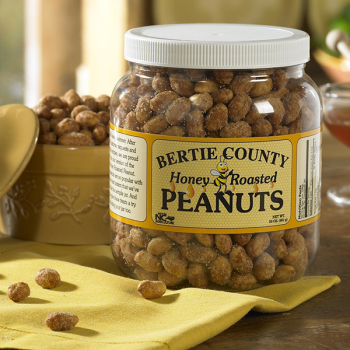 Recently Bertie County Peanuts was temporarily out of honey roasted peanuts, one of my very favorite of their products. I bought some from another NC supplier, who advertises on the I95 billboards. The competitor's honey roasted peanuts were good, but they were not fantastic. 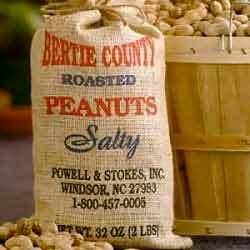 Next time I will just wait a few weeks and get the best -the honey roasted peanuts from Bertie County. Peanuts with a bit of honey. Just a delicious snack. We were planning to mail peanut products to our clients for a summer "we're nuts about you" campaign. 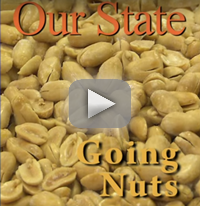 Our office tried the chocolate covered, honey roasted and blister fried peanuts. The results were 100% thumbs down. "Tasteless" "stale" "taste old" were the comments. Badly disappointed. These are a great treat. Not too sweet and not too salty. One of these days, I may just order it by the case. I absolutely love these honey roasted peanuts. They are the best I have ever had. I have purchased the honey roasted peanuts several times. I am always pleased with the product I have received. Light sweetness of honey roasted yet full peanut taste. You've found one of the best here, and won't be disappointed. I keep coming back. These are the best honey roasted peanuts I've ever had. I must say that thanks to the NC Museum of History, I was introduced to the wide range of nuts available from Bertie County. While we here in Charlotte can find their blister fried peanuts in any HT, it's too bad that they don't carry their other products - especially the honey-roasted peanuts! The national brands have nothing to offer in comparison and when I go back home to the Midwest, a few jars of this brand always make the trip, too. Gotta be NC Ag, for sure! Outstanding! These peanuts are fresh, and roasted to perfection. I wish I could buy them locally. The Honey Roasted Peanuts produced by Bertie County Peanuts are by far the best peanuts that I've ever eaten. Butterscotch and chocolate coverd make an astounding snack! Once the jar is opened, you can't keep your hand out. They're so good! I have given some to family and friends, their comments are the same. Absolutely the best honey roasted peanuts! We enjoyed the first three jars so much that we ordered we ordered six more. These are the best we have found. excellent peanuts with delicious coating of sugar cane and honey. Every year my co-workers look forward to getting their Bertie Peanuts. This year was the Honey Roasted and were a hit! I have tried all the honey roasted peanuts available in the US. Bertie's are by far the best. And, very fresh! Love the Honey Roasted peanuts!